United commercial success unrivalled, while Arsenal top the matchday revenue list. Based on 2014-15 revenues, United have slipped one position to third in the 19th edition of the Football Money League, but Deloitte is tipping them to take top spot in the Football Money League for the first time in over a decade next year. This is because United’s revenue will be boosted by the £75m-a-year, 10-year deal with kit manufacturer Adidas, and a £53m-a-year shirt-sponsorship agreement with Chevrolet. United are one of 17 Premier League clubs to claim a place in the top 3 – essentially all the clubs in England’s top flight with the exception of the three promoted clubs. United’s annual revenue dropped from £433.2m in 2013-14 to £395.2m due to the club’s absence from the Champions League last season, but Tim Bridge, senior manager at Deloitte said the club’s robust business model ensured the club could ride out short term failure on the pitch. “Despite a reduction in revenue year-on-year, the fact that Manchester United remain in the top three of the Money League demonstrates the underlying strength of the club’s business model,” he said. According to Deloitte, the 20 highest-earning football clubs in the world generated €6.6bn (£5bn) of revenue last season, an increase of eight per cent on the previous year. Real top the table for the 11th year in succession. But the growing financial might of the Premier League is illustrated by five clubs – United, Manchester City, Arsenal, Chelsea and Liverpool – claiming a place in the top 10. 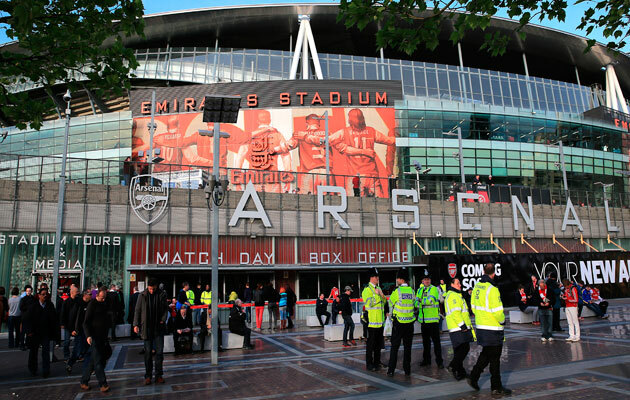 Arsenal’s Emirates stadium takes more money on matchday than any other ground in the world. Away from the riches of the lucrative TV deals, Arsenal are generating more money on match-days than any club in the world. The extra revenue brought in by their 61,000-seater Emirates Stadium, opened in 2006, shows them to be one of he world’s financial powerhouses. They made £101.84million last year, narrowly ahead of Real Madrid, who made £100.12m from games at the Bernabeu, and Barcelona, with a total of £90.17m made from the Nou Camp.<. Manchester United are next on the list, generating £87.96m from Old Trafford while Chelsea are sixth with £71.84m made from Stamford Bridge. Liverpool (£57.85m), Manchester City (£43.98m) and Tottenham (£41.83m) make it into the top 10 in eighth, ninth and 10th respectively. Dan Jones, a partner at Deloitte, said: “Chelsea won the Premier League in 2014/15 but off-pitch have been usurped by Arsenal as the top London club in the Money League for the first time since 2009/10, swapping places between seventh and eighth position. Source: Deloitte, revenues for 2014-15 season.